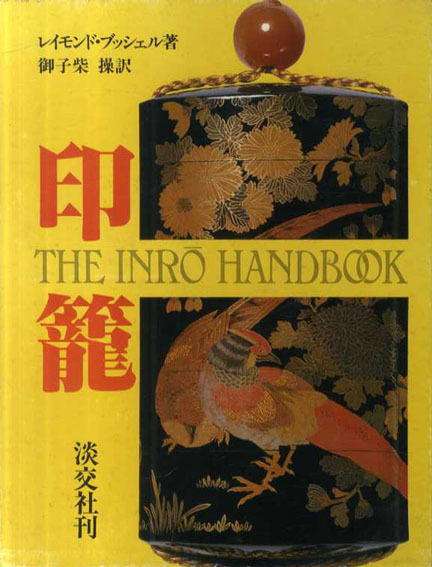 The term inrō derives from the Sino-Japanese roots in (from Middle Chinese 'jin 印 "printed") and rō ( 籠 "cage"). 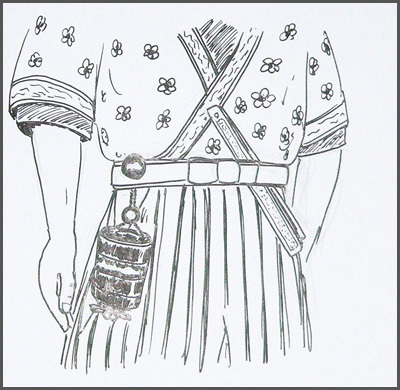 Because traditional Japanese robes lacked pockets, objects were often carried by hanging them from the obi, or sash, in containers known as sagemono (a Japanese generic term for a hanging object attached to a sash). Most sagemono were created for specialized contents, such as tobacco, pipes, writing brush and ink, but the type known as inrō was suitable for carrying anything small. Consisting of a stack of tiny, nested boxes, inrō were most commonly used to carry identity seals and medicine. The stack of boxes is held together by a cord that is laced through cord runners down one side, under the bottom, and up the opposite side. The ends of the cord are secured to a netsuke, a kind of toggle that is passed between the sash and pants and then hooked over the top of the sash to suspend the inrō. 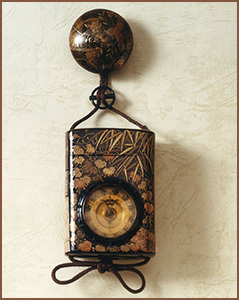 An ojime, or bead, is provided on the cords between the inrō and netsuke to hold the boxes together. 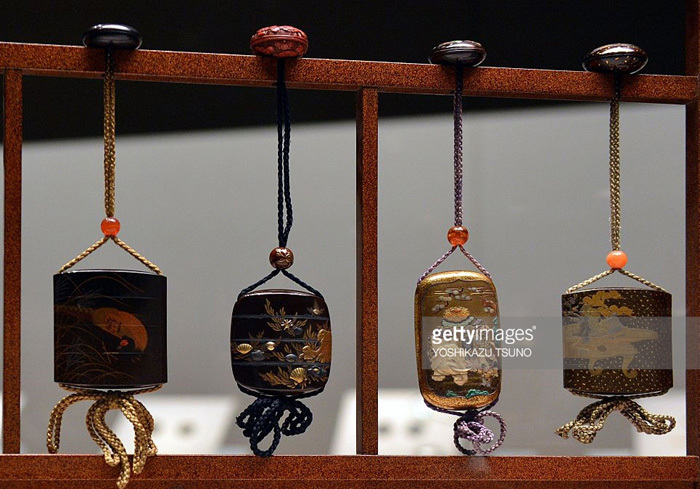 This bead is slid down the two suspension cords to the top of the inrō to hold the stack together while the inrō is worn, and slid up to the netsuke when the boxes need to be unstacked to access their contents. 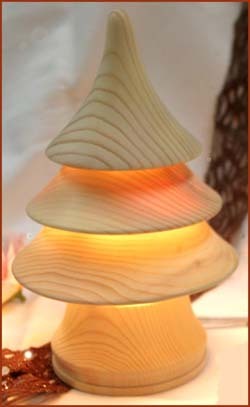 Inrō were made of a variety of materials, including wood, ivory, bone, and lacquer. Lacquer was also used to decorate inro made of other materials. Inrō, like the ojime and netsuke they were associated with, evolved over time from strictly utilitarian articles into objects of high art and immense craftsmanship.
. zooge 象牙 ivory, Elfenbein . 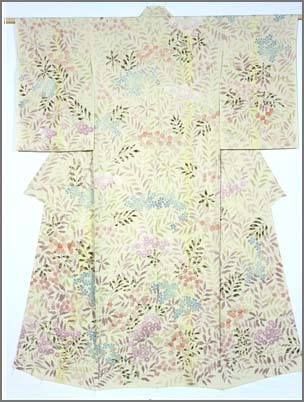 The exhibition provides a glimpse of these unique characteristics of the Edo gentleman’s wardrobe. Visitors are first met with a dazzling display of swords, which is specially lit to allow close viewing of the blades’ fine metalwork, engraving and patterning. Another highlight of the exhibition is the collection of tsuba (sword guards), the metal fittings attached between hilts and sword blades to prevent the grip from slipping onto the blades. 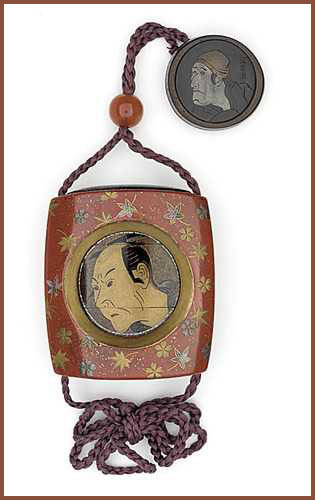 Perhaps the most famous accoutrements of the Edo gentleman, aside from his sword, were the inrō and netsuke. The inrō, a lacquered pill box small enough to fit into the palm of the hand, would be paired with a decorative netsuke toggle. On display at the exhibition is a beautiful 18th-century inrō stand that demands attention. A dizzying assortment of inrō hang from it, replicating how it would have originally looked in the gentleman’s home. Clearly the owner of this stand must have enjoyed displaying his prized inrō collection. Late Edo Period. Japanese-version of a portable compact watch in a casing resembling a pillbox. The dial rotates to keep time. The case is made entirely of turtle shell and covered completely in lacquer. This splendid clock has a sundial and compass in the lid. According to writing on the box, the clock belonged to Nariaki Tokugawa (whose posthumous name is Rekko) of the Mito domain.
. inkan 印鑑 seal . For medicine there were at least three different boxes to store different kinds of pills and drugs. To keep out moisture the aikuchi 合口 opening between two boxes had to be especially tight. This was one part of an Inro where the craftsman had to show his skill. The form of these boxes changed with time from simple containers to refined pieces of accessories for the rich.
. makie, maki-e 蒔絵 "sprinkled picture" .
. raden 螺鈿 mother-of-pearl - inlay .
. Tôshûsai Sharaku 東洲斎写楽 (active 1794 - 1795).
. WKD : 阿波踊り Awa odori dance . 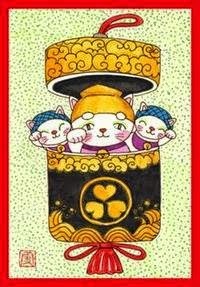 It is performed during the days of the Bon Festival (o-bon) in many parts of Japan nowadays. The Inro of many dancers have an extra-long string.
. WKD : natsubaori 夏羽織 light summer coat. CLICK for more Inro with Maki-e decoration !
. WKD : kigo related to the mirror . 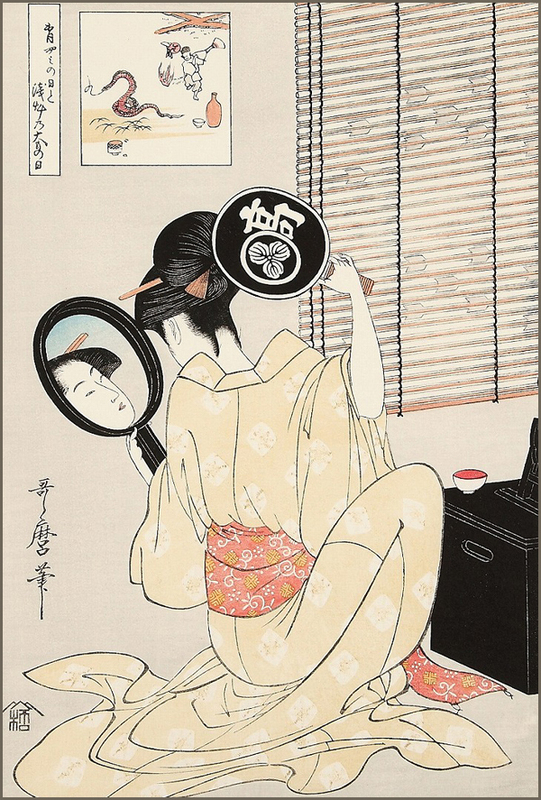 hatsu kagami 初鏡 "first (ue of the) mirror"
Mirrors were first introduced for religious rituals, but had been used by the aristocracy for combing and make-up since the Heian period. 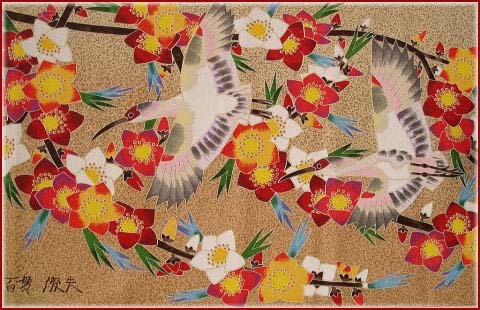 In the Edo period, they became widely used by all people. 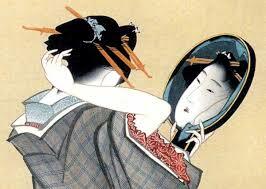 Since the mirrors of the Edo period lost their shine very soon, it was necessary to polish them regularly. The minor polish can be done to the sword with scuff markings or the sword with Hike ( Scratch ).
. Saeki Yataroo 佐柄木弥太郎 Saeki Yataro . The official togimonoshi 砥物師 of Tokugawa Ieyasu. ... There is a Buddhist belief that negative spirits will enter houses through the door if they have triangular-shaped roofs. Hanging a small circular mirror in front of the door will prevent the bad spirits from entering. 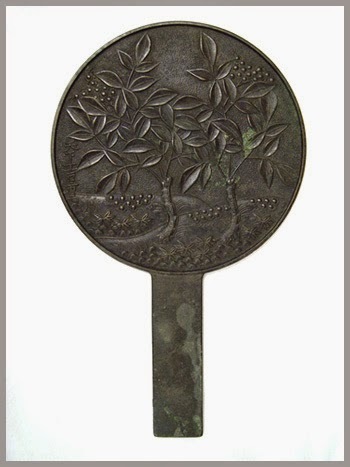 In Japan, bronze mirrors (imported from China c.300AD) were associated with Amaterasu, sun goddess and imperial ancestor — who, at the dawn of time, ordered her grandson to descend from heaven to rule over Japan and gave him a sacred mirror providing him and his successors perpetual access to the divine sun. 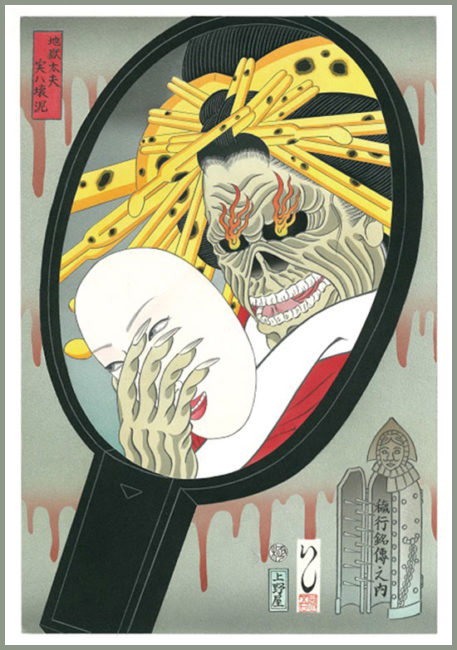 Throughtout medieval Japan, mirrors were considered sacred objects—used not only in rarefied imperial ritual and display but also to ward off evil spirts and, when placed in Shinto shrines, to speak with the gods. ..... In Japan, bronze mirrors are known as magic mirrors, or makkyo (魔鏡). One side is brightly polished, while an embossed design decorates the reverse side. Remarkably, when light is directed onto the face of the mirror, and reflected to a flat surface, an image magically appears (usually the one featured on its back). While the metal is completely solid, the reflected image gives the impression that it must be in some way translucent. For many centuries, the ‘magic’ of these mirrors baffled both laymen and scientists. Kyoto Journal sat down with the man rumored to be the last remaining makkyo maker in the world — Yamamoto Akihisa — and his friend, Yoshida Hisashi. 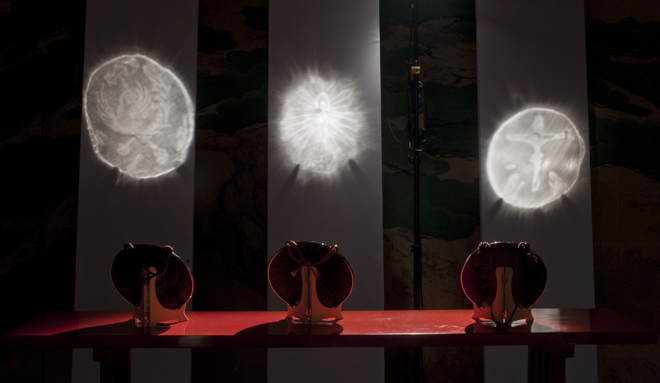 Mr. Akihisa is descended from a family of mirror makers based in Kyoto.
. WKD : kagami 鏡 mirror . 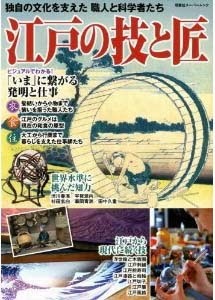 that relies on basic operations of measuring, cutting, and gluing.
. akahon 赤本　red book . Also read fukurotsuzuri. Also called karatoji 唐綴 and fukurozoushi 袋草子　(fukurozooshi). Lit. pouch-binding. 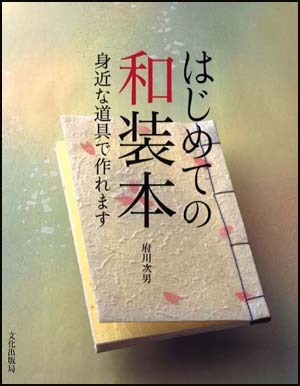 The most common type of book-binding in Japan, made of thin sheets of paper which are inscribed or printed on only one side, folded in half, text-side out, and stacked together. Covers are added to the front and back, and the book is stitched along the spine (the edges opposite the folds) so that each double-leaved page forms a pouch, fukuro 袋, which is open at the top and bottom. Although variations exist, typically four tiny holes are made at equidistant lengths along the spine edge and the sheets and covers are then bound together tightly with thread. The fukurotoji was introduced from China and began to replace most other binding styles after the 14c. One of the earliest examples is the Anthology of Regent Ichijou ICHIJOU SESSHOUSHUU 一条摂政集 (mid-12c). 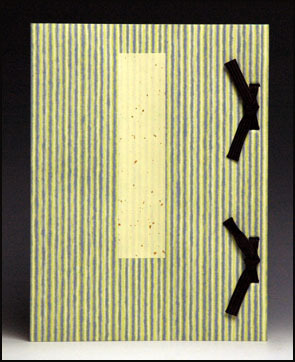 Double-leaved pages are pasted together indicating the initial stage of pouch-binding.
. horishi 彫り師 block carver .
. kibyooshi 黄表紙 Kibyoshi, "yellow book covers" . A type of book-binding, which, according to some, is the same as *detchousou (detchoosoo, detchōsō 粘葉装 (paste-leaf book). Others maintain that it is the same as *retchousou 列帖装 (a multisection book). The finished book opens so that each pair of leaves joined with paste stand out at an angle like the wings of a butterfly. 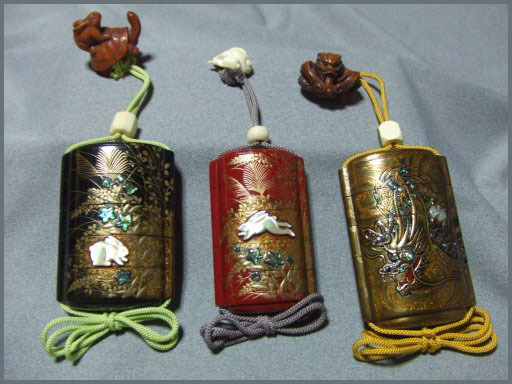 The term kochousou (Ch: hudiezhuang) was used for this type of paste binding in China. Also tetsuyousou (tetsuyoosoo) 綴葉装 or retsuyousou (retsuyoosoo) 列葉装 retsuyoso. A multisection book. A type of Japanese book-binding. The first three to five sheets of paper are piled up and folded in half to make a set. Then several sets of folded sheets are arranged in a neat pile with the folded edges forming the spine. The binding is made by sewing the sections together using a complex and time-consuming procedure. 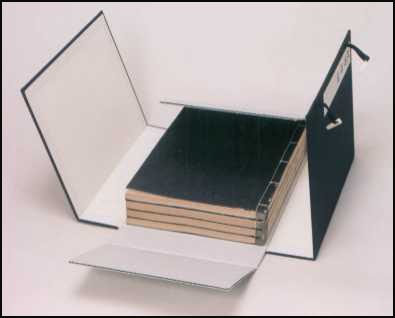 The finished book, therefore, can be opened perfectly flat. 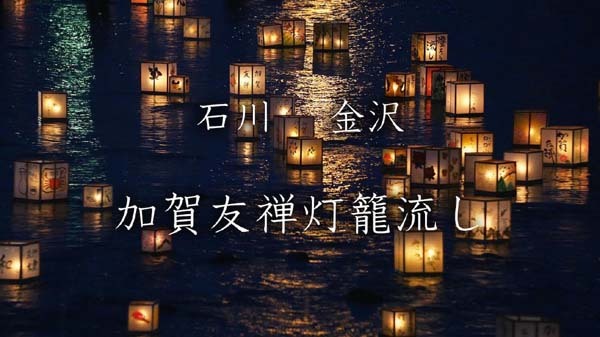 Retchousou originated in Japan in the 12c, and was widly used for works of native literature, including narrative stories, *nou 能 texts, and anthologies of Japanese poetry (waka 和歌). It was not used for Chinese or Buddhist texts. Confusingly, the terms *kochousou 胡蝶装 (butterfly book) and *yamatotoji 大和綴 are sometimes used to refer to multisection books, and during the late Edo period even the term *detchousou 粘葉装 became confused with retchousou.
. surishi 摺り師 printer . Also musubitoji 結び綴じ, lit. knot-binding. 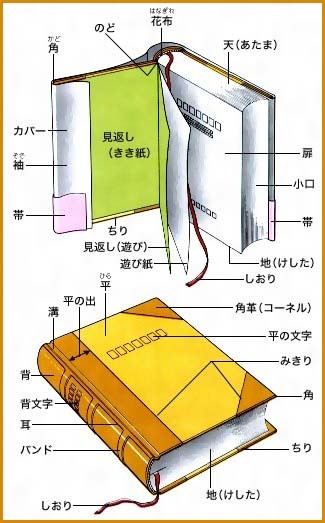 The simplest style of book-binding and usually a type of pouch-binding fukurotoji 袋綴. 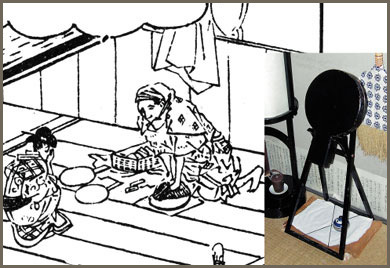 The process of making yamatotoji involves punching four (or sometimes two) horizontal slits in the book near the spine and threading a flat cord (or sometimes a strip of paper) through each pair of slits. The cord ends are brought to the front, and each cord is secured tightly with a square knot. Yamatotoji also uses long corner pieces added to strengthen the otherwise unsupported corners. Extant examples, dating from the 12c, are decorative books, often waka 和歌 anthologies, in which colorfully designed cords and front and back covers are used. This binding style, is sometimes called kochousou 胡蝶装 (kochoso), although this generally refers to a different type of book-binding. This monograph covers every major aspect of the book in traditional Japan: its place in Japanese history; books as material objects; manuscript cultures; printing; the Edo period book trade; authors and readers; and importation and exportation." 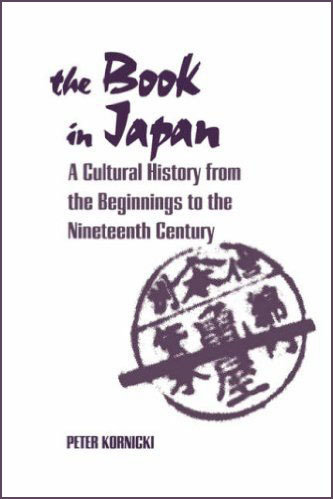 Here is a brief sketch of the development of the Japanese book binding trade from its early development to its commercial beginnings and eventual industrialization written by Dana Gee. The word in Japanese for bookbinding is seihon. 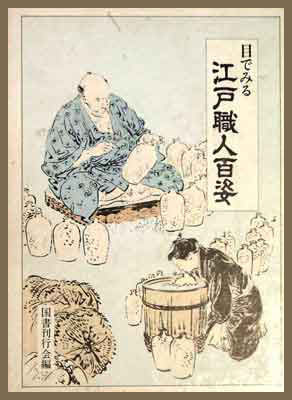 Papermaking was developed in China during the Han dynasty in the second century AD; the earliest recorded reference to papermaking in Japan was around 610 AD. The earliest “books” were calligraphed paper rolls. Beginning during the Tang dynasty period in China (618-907), Buddhist texts were folded accordion style, making the texts easier to handle, less fragile. The folded edges form the edges of the pages. This is called 折本 orihon (concertina or accordion-style binding) in Japan, common up until the nineteenth century, and is still used. In addition to Buddhist sutras, this form was used for maps, calendars and some types of reference books. 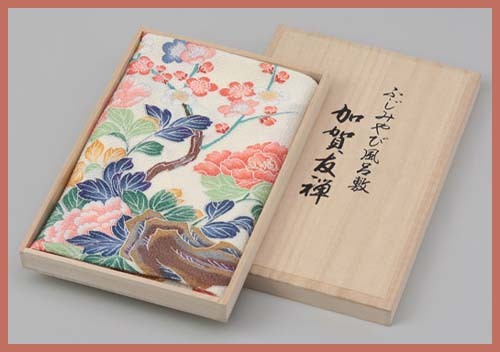 By the time the book trade in Japan became established, in the Tokugawa or Edo period (1603-1867), the form known as fukuro-toji was the most common type of Japanese binding. Practised in China early as the Tang period, widespread by the Ming dynasty period (1368-1644), and transmitted to Japan in the Muromachi period (1392-1573), by end of which, in the late 16th century, it had become the standard form for printed books. Each page had printed or handwritten text on one side only, folded with the text on the outside, and placed on top of its predecessor; assembled pages are sewn together, the stitches passing through the blank margins next to the loose edges, so the sewn edges form the spine and folds form the edges of pages. 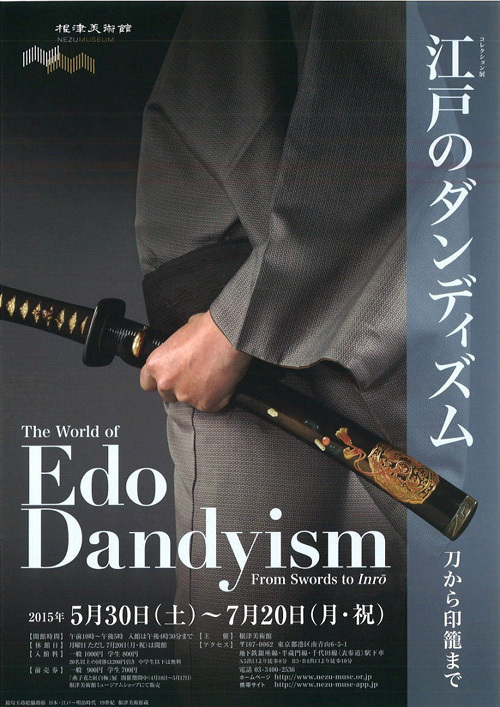 This stringbound style continued through the Meiji period. Books were handmade and calligraphed until the advent of block printing, originating in China, with the earliest known East Asian examples produced in Japan and Korea in the eighth century. Texts produced for the reading public were not introduced until much later in the Heian period, in the eleventh century. In the Kamakura period the temples of Kyoto began printing; it was the center of printing for the next 500 years. By the Tokugawa period, most books were produced in three cities: Edo, Kyoto and Osaka. It was during this period that the rapid growth of the publishing industry created the publishing houses, guilds and book trade professions. Printing shifted from private printing under patronage to mostly commercial printing by the mid 17th century. 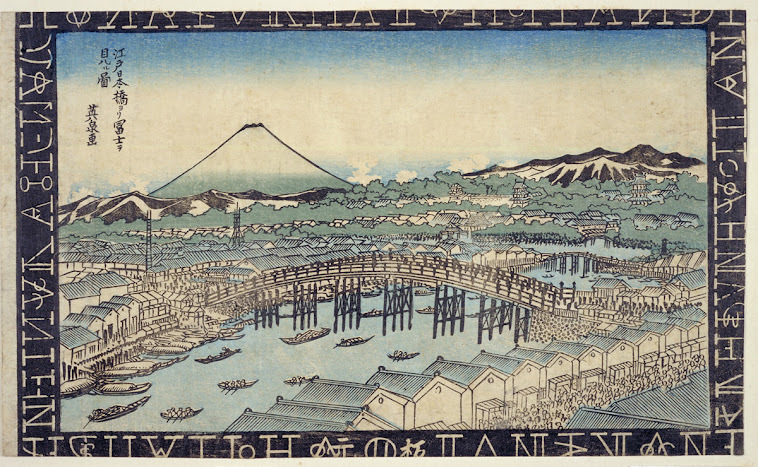 Movable type was introduced in the mid 16th century, but woodblock printing was dominant until the 1880s. 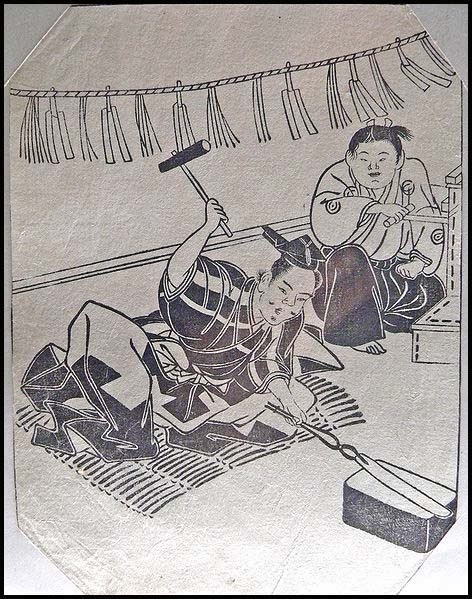 During the Tokugawa period, the process for producing a book was a collaboration of artists and craftsmen and women. 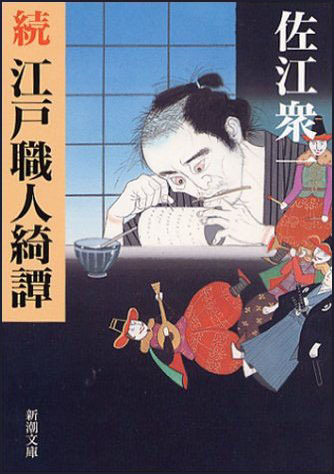 First the text would be given to the copyist, or hanshitagaki (the copy was called the hanshita). The copied text would be given to the block carver, horishi. The carved block would be passed to the printer – surishi – and after printing to another worker for page alignment. The maker of covers was the hyoshiya. Book covers would be paper with thick backing; from about the 17th century onward, design became an important part of commercialization and marketing. With larger firms, all the book trade craftspeople would work together in-house – “but smaller-scale publishers contracted some parts of the process out to sub-contracting specialists like block-carvers and binders, and cover-makers ran their own separate firms from the early seventeenth century onwards.”viii Bookbinders did not get credit like publishers/booksellers, artists or designers. Sometimes copyists and block carvers were named in colophon, but rarely binders. 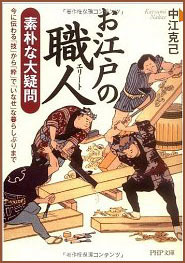 Women worked as binders during the Tokugawa period. 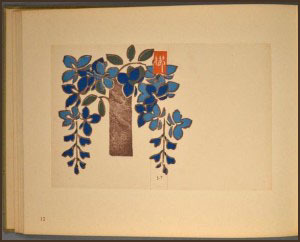 The transition from all hand work to kikai zuri , or machine printing, didn’t start in earnest until the 1880s; books transitioned from monotypes to hybrids with woodblock, or collotype under-images with woodblock printing on top, to fully machine printed materials, perfect bound Western style. Traditional binding is still practiced. 1929: TSUDA SEIFŪ, designer. 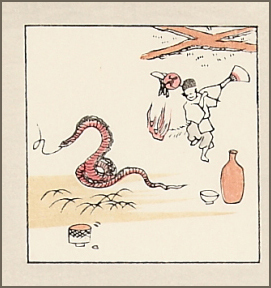 (a page from) SŌTEI ZUAN-SHŪ Dai-Ishū. The earliest publishing houses emerged in Kyoto around 1600; simply called hon'ya (bookstores) they engaged in both printing/publishing and retail, and numbered over a hundred by the 1630s. 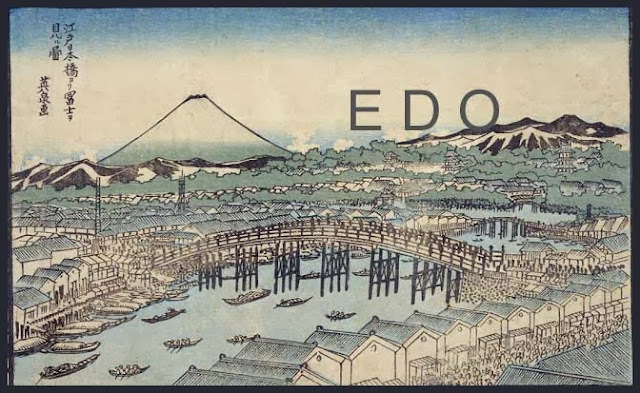 Over the course of the entire Edo period, an estimated 3,757 publishing/bookstore operations were established in Japan, 1,530 of which went out of business before the end of the period. Publishers would often initiate projects, deciding on themes and hiring illustrators or print designers. The illustrators would then submit their designs to the publisher, who would then take over much of the remainder of the process. - the verb 上梓 (jôshi), meaning "to print" or "to publish." Sumi - the same black ink used for painting and calligraphy was used for printing blacks and greys. Dayflower blue (tsuyukusa) - a light blue hue which reacts easily to moisture, turning yellow. Prussian blue - the first chemical/artificial pigment developed in the world (i.e. deriving directly from neither vegetable or mineral sources); first used in Japan in 1829; a deep, rich blue that does not fade or discolor. Beni (safflower red), used to produce various shades of red, pink, orange, and yellow. Purples obtained by mixing dayflower blue with safflower red, or by other means. The Pulverer Collection, acquired in its entirety by the Freer Gallery of Art in 2007, includes numerous rare and pristine examples of Japanese illustrated books produced in the Edo period and beyond. ..... 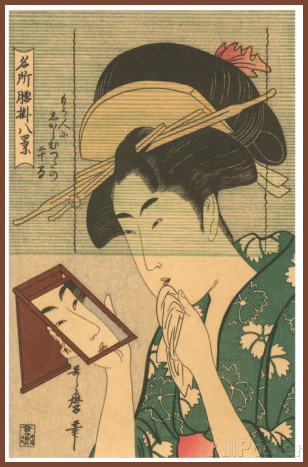 This online catalogue offers three ways of searching, and provides a set of annotation and comparison tools to use while researching the collection.
. Miyasaka Shizuo 宮坂静生 . furuhonya, furu-honya 古本屋 selling old books .